This topic contains 18 replies, has 3 voices, and was last updated by Ken 5 months, 1 week ago. The Peterbilt 352 Cabover is in a class by itself with custom styling, functional design and uncommon rugged beauty. The impressive Peterbilt 352 tractor is a trucker’s dream. This cabover engine design reflects Peterbilt’s thoroughness in the manner that they engineer and build heavy duty trucks. Every Peterbilt that rolls off the assembly line is custom built to suit the needs of each customer. The Peterbilt 352 Cabover is a 10-wheeler with 110′ cab and has comfort and elegance built into the driver’s compartment and sleeper. The high standard of manufacturing excellence sets it apart from all other trucks. BTW, this is no slouch – in its current configuration it will complete a lap in the 8 second range… but its real purpose will be to transport race models and/or pull a track conditioning/cleaning trailer… stay tuned!!! Very cool! It runs really well too. There’s nothing like the sound of 10-tires running down the track on one vehicle! It will never roll over. That’s a fact. Watching it fly through the corners was pretty amazing. I feel sorry for the guy behind the tire truer. I was at Hornet Hobbies today and this thread got my eye to notice this 1/32 tanker. However, I don’t have a track or truck. It’s in a factory sealed bag with nice tires etc… Art. Please consider this as trade for the Tudor you already donated? It might look nice behind that cab, or off to the side somewhere. I could not pass it by. Bing Bing Bing Bing!!!! Jackpot!!!! Excellent! That tanker is awesome! I’m already on it! How to get it to go around the corners and under the gantry/bridges – perhaps either cut into an articulated trailer or just chopped into a short one… hmmm… since it is supposed to be flammable filled with lighter fluid… to clean the tape… hmmmm…. that would definitely complete the 18 wheels! You’ve been way too generous so far Ken – I’d be happier sorting out something like a suitable trade or the like…. we’ll discuss when I see you next – Thank you for picking it up! It’s a bit over 15″ inches long. 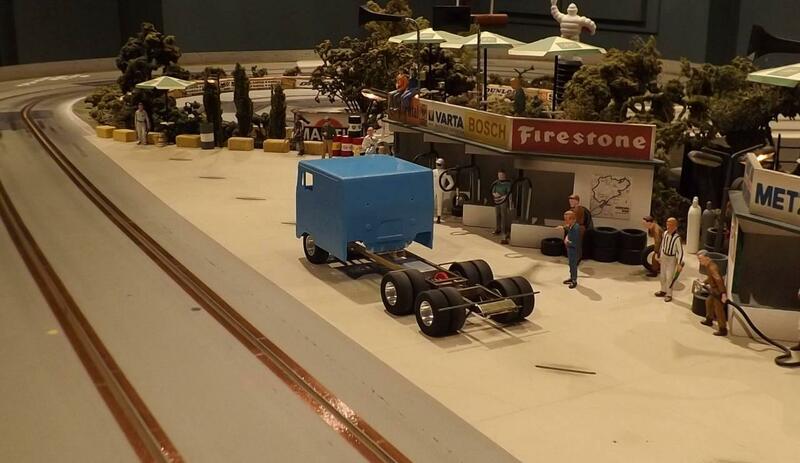 The tanker is shorter in height than the typical box trailers. It might actually fit under your over-passes with very little effort. I don’t want to break the factory seal so we’ll find out when I bring it over. Cone shaped tires with the inside diameter larger than the outside are a subject for on going discussion – I have my opinions backed by racing – I invited the world wide globalized idol and slot car guru and genius and technical editor of a leading slot car magazine – Mr. ‘Unobtainium’ himself – to share his thoughts on this subject via email but he remains silent – I know he has an opinion since I heard snippets from others but I guess he doesn’t want to share it in this forum. Please remember that the information we all share on our website is geared for our local audience especially those with whom we race and those which share the same rules – others are welcome to participate but that will never change our focus. I’ve spend a great deal of time trying to please everyone around the world with poor or unsatisfactory results/feedback. Just look at some of the proxy races I hosted where I not only sent hundreds of dollars in door prizes and posted more than 200 photos for the round I hosted with commentary but was still criticized… for any number of reasons… so now please excuse me for focusing locally – on us – since those that participate directly understand and appreciate the time and energy it takes to accomplish whatever this is that we’ve done so far here… some (locals who are particularly notorious for their ability to scratch build and you know who I’m talking about) said ‘it will never work’ or they just gave up on the rest of us – nuts I said – and so now here we are – 10 years later – more models – and even a Pre-war Class… looks like we won. As far as quality – I’m not sure there are any other groups in Canada that can hold a candle to our ambition – sure we have beginners but boy do we have some sweet rides too! There is a reason why you don’t hear from some who claim to be the best scratch builders in the GTA on this website. Some never like to be challenged or beaten fair and square – those are their gripes – I’ll leave it at that. The day anyone has to apologize for being good at something is a sad day indeed. Unlimited motor and chassis (scratch or RTR) and a marked tamperproof tire on a neutral track – a combination that should be embraced by anyone wishing to have a fair race – we have this series already – but funny how there aren’t many takers… several who boast to the rest of the world do shy away and continue to opt in to restricted ‘low power’ motor races with unchecked tires against their peers – funny how that is…. I would like to formally apologize for starting a debate with respect to theories in tire-truing. That was not my intention. It’s in my nature to question everything. It’s the only way I learn. I asked everyone I could about it. Cone shaped tires have more bite in the corners. Almost everyone has agreed on this. In a perfect world. I would love to see everyone that became upset for any reason, become friends again. I call it “Slot Car Heaven”. Call me narrow minded. Or a newbie that doesn’t yet understand the politics of slot cars. I’m here only to have fun whether I win or lose. So far I’ve done more losing than winning. But that’s okay because I’m learning. Speaking of tankers. I found another one. Nice wheels and tires . Plumbing is nicely detailed too. Well, our little cars will certainly have lots of gas now!! If these are too tall for the bridges. Maybe one gas tank can be converted into a small diameter Praxair high pressure tank. That might fit under all the bridges without having to change the suspension. We’ll see what happens when the build continues. I look forward to it. Those suspension pieces are nice details and I’m thinking of how to replace the ‘pins’ with either short 3/32″ axle stubs or full axles drilled through… either way they appear to be very formidable pieces! But first I need to finish the tractor…. Late last night I had a chance to take a closer look at a vintage Ford 600? 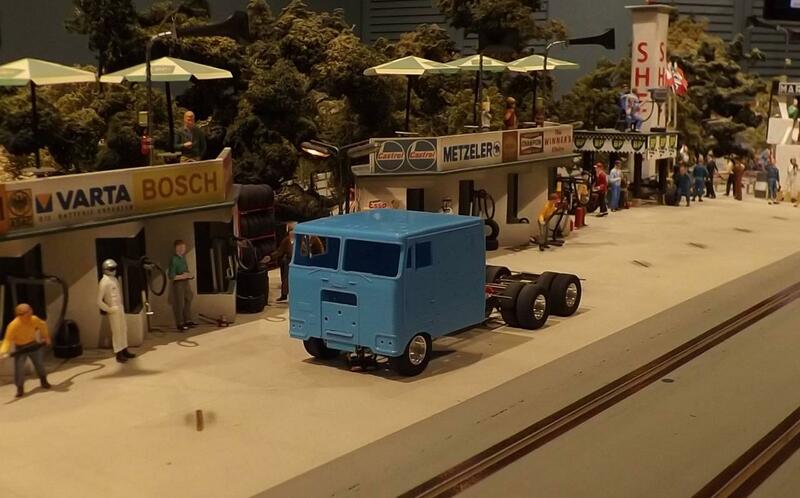 1:32 tractor/trailer kit… a north American style Ferrari team transporter to be precise – which might be something to seriously consider building for this genre… it isn’t for all – but boy do they all look great! Amazing workbench! I know what I want for Christmas. Let’s see a close-up of the trailer please? I’m never going to build one. But it’s fun to watch new challenges being tackled.